The READ WATCH PLAY blog is the home of a monthly reading group that encourages everyone to ‘read’ & tweet about what they are reading. Each month has a different theme, even if you don’t tweet why not use the themes as reading inspirations. ‘Reading’ can encompass anything that provides enjoyment, knowledge, understanding, and relaxation…be it a book, a movie, a game, or a piece of music. The JOY of reading – is there any better way to celebrate this month? 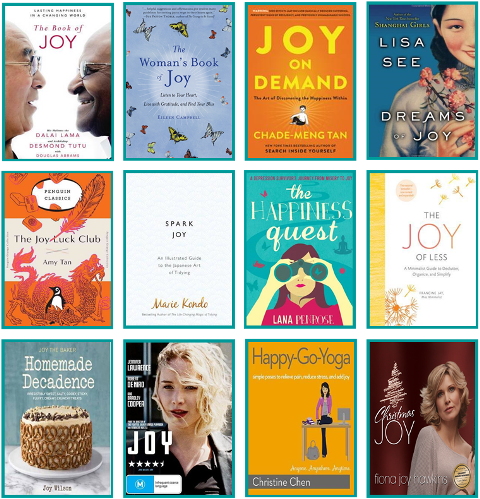 Find your inspiration in a book or dvd —the Library is sure to have something to bring you joy. Whether you love reading an old favourite or discovering a new author, why not share your joy by joining the conversation.